WOW, a week since the last blog entry! Where does the time go? 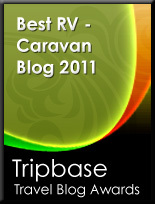 Last Thursday we moved from Tucson to the Tombstone Territories RV Park. Like the Diamond J RV Park this is out in the middle of nowhere. We are 10 miles west of Tombstone; which isn’t much of a town and 17 miles northeast of Sierra Vista which is a typical American town with all of the usual strip malls, big box stores and chain stores you would find in any American city. In the 80 miles or so from Tucson we have moved from the Sonoran Desert to the northwest corner of the Chihuahuan Desert. The setting is so different; the area around Tucson had not only Saguaros but many other kinds of cactus and had a lot of each type. Here there are very few cacti at all and not many of those. The dominate plants are Coyote Bush and Desert Acacia. The RV Park has an incredible view; we can see east or west for about 30 miles to the surrounding mountains some of which still have snow. We can see north or south for at least 50 miles and can see the mountains in Mexico. There are many more birds here than in Tucson. 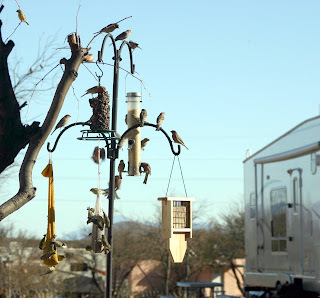 When we put out our bird feeders in Tucson it took 4 days until any birds showed up. 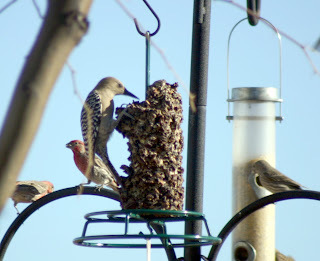 Here it took less than an hour and we have had many more birds visit the feeders. We have added two new life birds while sitting here in camp; Canyon Towhee and Lark Bunting. Other campsite birds include: White-winged Dove, Lesser Goldfinch, Lawrence’s Goldfinch, House Finch, Curve-billed Thrasher, Black-throated Sparrow, Gila Woodpecker, Gilded Flicker, Road Runner, Chihuahuan Raven and Cactus Wren. 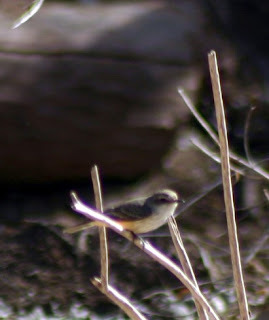 What is very odd is that this part of Arizona is world famous for humming birds both in numbers and species. However, in our week here we haven’t seen a single humming bird anywhere we have traveled in the area. I am beginning to think that the RV lifestyle does not lead itself to good birding. Friday I got up at 7 AM; after having breakfast and taking Raider for his daily run in the desert we didn't leave here until 9:30. We are within a mile or two of the lower unit of the San Pedro Riparian National Conservation Area. www.blm.gov/az/st/en/prog/blm_special_areas/ncarea/sprnca.html . We got there and saw sign that said river loop 1.6 miles; we found out after walking the 1.6 miles that it meant that it was 1.6 miles to the river loop trail not that the river loop trail was 1.6 miles in total. We ended up doing 4 miles as the day got hotter and very little shade. Naturally there were very few birds out as the day was getting warm. We ended up with 22 species of birds for the walk. The temperature high for the day was 82 but there was a nice breeze on the patio. Saturday we went to the town of Tombstone and I was underwhelmed; even as a tourist trap it wasn't very interesting. The old part of town is only about two blocks long and just one trinket shop after another. The actual OK Corral were the famous Wyatt Earp gunfight occurred is behind a 10 foot high stucco wall and can only be seen for a fee. The high for the day of about 78 but, it i\was windy. Sunday the wind was stronger than it had been on Saturday and much colder. 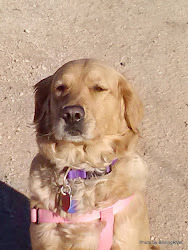 We went to Mass in Tombstone and shopping in Sierra Vista, and then just stayed out of the wind the rest of the day. On Monday we awoke to 24 degrees and a frozen water hose. The wind had pretty much stopped but, it was very cold. We took Raider and a picnic to the town of Bisbee. Bisbee was a center for copper mining. This was a much more interesting town that Tombstone and much bigger. The Post Office that they still use was built in 1902 and it has many other brick buildings from around 1900. Although, you can find T-shirt shops in Bisbee it also has art galleries, restaurants, and even a brew pub. Tuesday we tackled a home improvement project that Kathy has wanted me to do since we bought the trailer. Everyone who knows me knows I am NOT a handyman. Naturally, as these things go it took two trips to Sierra Vista (36 miles round trip each time) but, once it was done it came out very nice. Kathy now has a cabinet where there use to be a VERY TALL drawer. Wednesday turned out to be our busiest day since we have been here. The San Pedro Riparian National Conservation Area is run by the BLM (Bureau of Land Management) www.blm.gov/az/st/en/prog/blm_special_areas/ncarea/sprnca.html. They have different rules than the National Parks and State Parks; the best different rule they have is dogs are allowed on the trails! So, Wednesday morning we took Raider with us as we birded the Upper Unit of the San Pedro Riparian National Conservation Area. This area has much more water than the lower unit and even has a couple of small ponds. We added some birds to our local list like Common Bushtits, Bewicks Wren, White-breasted Nuthatch and our first ducks of the area, Mallards & Shovelers, but the neatest thing was an abundance of Vermilion Flycatchers. Wednesday afternoon we got our chance to see Kartchner Caverns www.pr.state.az.us/Parks/parkhtml/kartchner.html . This cave system was only opened to the public about 9 years ago and is still a “living cave”, which means it is still growing. This is a very popular attraction in the area and reservations must be made well in advance. They have many restrictions about what can be brought into the caverns and they do not allow cameras. It certainly was an awesome experience. Today (Thursday) was one of those groceries and laundry days that come up from time to time. Today was also cold and windy; it was 29 this morning at 7:15 AM and today’s high was only in the 50s. Tonight we are expecting a low of 25. 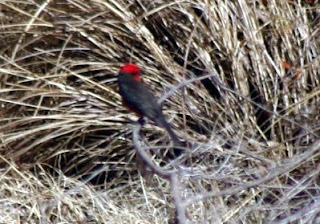 As unpleasant as it sounds you should revisit southern Arizona in summer - the heat is worse but the birding is better. Then you would be3 sure to see a few hummingbirds, or maybe a few hundred. If you get tired of the desert try southeast Texas. Our winters are about as mild as you would expect in coastal California, and you can't beat High Island in spring!